The Lux Sauna line is one of the most popular far infrared saunas available, and it is gaining momentum as a leader in the industry. LuxSauna manufactures far infrared saunas rather than the more traditional wet environment systems that require steam to generate the intense heat that so many people are familiar with. As an infrared sauna, Lux Sauna uses a combination of carbon fiber heaters and ceramic heaters, giving users better coverage than in more typical infrared units. 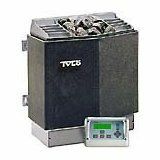 The carbon fiber heaters help maintain a constant temperature while the ceramic heaters use a broad surface area to make sure the entire body is exposed to the healing far infrared rays. What you'll notice the first time you use a far infrared sauna is that you don't get that uncomfortable, claustrophobic feeling some people get in a traditional sauna. This is because far infrared heat focuses on heating the body with deep, penetrating heat rather than heating the air around you. You'll also notice that there is no steam involved - this is a warm, dry heat that pampers the body without overheating it. It's excellent for anyone with breathing problems who may not like the steamy environment of a more traditional sauna. If you prefer the dry, penetrating heat of an infrared sauna, this is one of the brands you should take a look at. 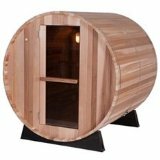 They offer a solid lineup of excellent saunas in several sizes and styles that can hold anywhere from one person to four persons comfortably. Every one of their units uses Canadian Spruce, an exceptional hardwood that will last for years. The seating is especially comfortable in Lux saunas, using a bench seat with an ergonomically contoured back for full support and comfort. Thoughtful extras include an integrated sound system and full glass doors to give you a more expansive view and allow others to see who is in the sauna. 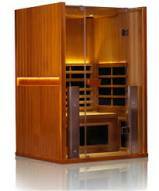 The overall design of these saunas is particularly attractive and will blend in perfectly with any décor. You can set the time for anywhere from 5 minutes to 60 minutes, letting you choose precisely how long you want to relax in your sauna. The heaters generate between 7 and 14 microns of far infrared heat, which is one of the best outputs in the industry, making Lux saunas more efficient than other models. Lux saunas are excellent infrared saunas with exceptional craftsmanship. 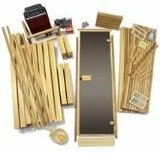 They come as a kit and it shouldn't take you more than an hour or so to fully assemble your unit and begin using it. They do also offer a relatively inexpensive cover if you want to use your infrared sauna outdoors in a protected area, but these saunas are really designed for indoor use. Fortunately, the Lux Sauna line is so attractive it looks great wherever you place one in your home.